Liliia was born and raised in the Oktyabrsk town, Russia. After graduating from School number 8, she got a training at the Nursing at the Medical College for two years. A year later, she moved to the Penza city to study a Medical Cybernetics and Informatics at the Medical Department of the Penza State University. During her studies, she was working in a pre-clinical project entitled ‘Device for early diagnostics of the gallstone disease ‘. 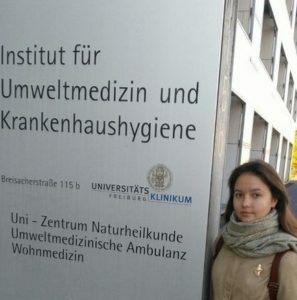 In 2016, she won the President Scholarship to Dr Irina’s Nazarenko lab, to work in Uniklinikum Freiburg, Germany. Liliia completed her Master degree in Medical Cybernetics and Informatics in 2017 and she was always interested in the medical diagnostics development so much that she decided to pursue a PhD. She likes sewing, collecting herbs and making tea from them.